The initiative includes performances and special events throughout the city – including theatre-themed events in all 77 community areas, as part of the Chicago Park District’s ‘Night Out in the Parks’ series. The City of Chicago and its partners will also launch a marketing campaign; provide additional financial grants to theatre projects; encourage dialog around inclusion and equity; and call on civic, philanthropic, arts and business leaders to support the theatre community. For press announcements and free public events, visit ChicagoPlays.com. Under the leadership of Mark Kelly, Commissioner of the City of Chicago’s Department of Cultural Affairs and Special Events (DCASE), and Deb Clapp, Executive Director of the League of Chicago Theatres, the Year of Chicago Theatre (YOCT) is being organized by five committees comprised of over 100 members – focused on Inclusion, Legacy, Marketing, Partnerships and Special Events. See below for information on each committee’s membership and their key initiatives. Committee Members: Mary Kate Barley-Jenkins , Adventure Stage Chicago; Quenna Barrett, Goodman Theatre; Tony Bruno, UrbanTheater Company; Michael Dalberg; Lauren Gardier, Writers Theatre; Isaac Gomez, DePaul University, The Theatre School; Evan Hatfield, Steppenwolf; Emmi Hilger, Something Marvelous; Felicia Holman, Links Hall; Emily Hooper Lansana, University of Chicago Logan Center for the Arts; Nikki Patin, University of Chicago Arts and Public Life; Hillary Pearson, Harris Theater; Christine Perez, Chicago Latino Theater Alliance; Kemati Porter, ETA Creative Arts ; Julie Proudfoot, Artemisia; Jonald Reyes; Marcus Robinson, Collaboraction; Daina Sauls, League of Chicago Theatres; Mara Stern, Northlight Theatre; Regina Taylor; Jimalita Tillman, Harold Washington Cultural Center; Ellen Willett, Steep Theatre Company; Angel Ysaguirre, Court Theatre; Dominique Boyd, University of Chicago Logan Center for the Arts; Neel McNeill, Definition Theatre Company. Commissioned artist Paola Aguirre to create a theatre asset mapping project at the Chicago Cultural Center (through June 23, 2019). Through this installation, visitors to the Cultural Center will have the opportunity to document theatre assets – including people, organizations, facilities, businesses, and place-based histories that have supported and continue to inform the development of theatre in our neighborhoods. Developing a system for capturing key data metrics that can be used to assess trends, to shine a spotlight on Chicago’s theater scene, and to advocate for the benefits theatre provides to individuals and communities. Convening theater districts and other groups of theaters to create dialogue related to resource sharing. Planning to curate and present a Chicago theatre showcase for national/international programmers and journalists to broadcast to the world the richness of the Chicago theatre community. – Project Grants in support of initiatives that have the potential to impact the Chicago theatre sector at large will be made through DCASE’s CityArts Program. We anticipate awarding 4-15 Project Grants ranging from $5,000 – $50,000. – DCASE will also offer Microgrants in support of projects that are increasing diversity and access in Chicago’s theatre sector, with a focus on Chicago’s South and West sides. We anticipate awarding 15-20 grants ranging from $500 – $5,000. Developed brand positioning, statement and subsequent Brand Book and Brand Presentation. Assembled YOCT Digital Toolkit that includes suggested copy for social media posts, a number of digital graphics, example messaging, a boilerplate for press releases and three versions of the sizzle reel of varying lengths. Released Press Announcements (9/17/18, 2/11/19) and continue to actively cultivate new press opportunities. Organized the collective social media launch of the YOCT on New Year’s Day. Launched a comprehensive regional advertising campaign that includes rack cards and a program booklet, digital billboards, signage on City Information Panels, street pole banners, Big Belly recycling unit graphics, advertising on CTA trains and buses, advertising at O’Hare, and wall graphics and a Hot Tix presence at McCormick Place. Working closely with Choose Chicago as they developed their largest-ever digital marketing campaign for theatre as well as hosting theatre-themed individual and group media tours throughout the year; and media promotional events in New York City, London, Toronto, Montreal, Paris, Munich, Mexico City, Sao Paulo, Beijing, Shanghai and Tokyo. Working to cross-promote the WTTW Stage Players series of 1-minute videos showcasing the actors, architects, playwrights, choreographers, ushers, stage managers, patrons and others who make Chicago’s theatre scene one of the most thrilling and vibrant in the country. Working to build strategic partnerships with the Chicago Park District (Night Out in the Parks), Chicago Public Library (theatre-themed bookmarks available in branch libraries – and more), Chicago Public Schools (Department of Arts Education) and other City of Chicago departments and sister agencies. Secured $1 million in foundation support for the YOCT. Grants received from BMO Harris Bank, Bayless Family Foundation, The Chicago Community Trust, Illinois Arts Council Agency, The Joyce Foundation, Lloyd A. Fry Foundation Endowment at Millennium Park Foundation, Millennium Park Foundation, Prince Charitable Trusts and Richard H. Driehaus Foundation will support inclusion and equity initiatives, additional grants to theatres, performances and special events for the public, and a marketing campaign that leverages a new brand for Chicago theatre. Coordinating a Chicago Cubs Theatre Community Night (September 3, 2019). Partnering with Art on theMART to coordinate theatre-themed digital art projections (Wednesday – Sunday, ongoing). Discussing a partnership with Illinois Restaurant Association (Chicago Gourmet Week). Exploring a partnership with The Magnificent Mile Association (Lights Festival). Organized a Theater Leadership convening with executive and artistic directors and their board members. A second convening is scheduled in May. Working with Chicago Loop Alliance on the 2019 ACTIVATE season (ACTIVATE: Backstage), a series of four summer nights inspired by the art of performance – aligned with the Year of Chicago Theatre. Served as the planning committee for It’s Showtime, Chicago!, the Year of Chicago Theatre launch event aligned with Chicago Theatre Week 2019 – attended by more than 750 patrons and theatre stakeholders. Strengthening YOCT efforts through ongoing community advising on new public programs and collaborations in the Year of Chicago Theatre, including: stakeholder convenings, youth engagement programs, neighborhood initiatives and select agency collaborations such as Chicago Park District Night Out in the Parks and Chicago Public Schools Youth TheatreFest. 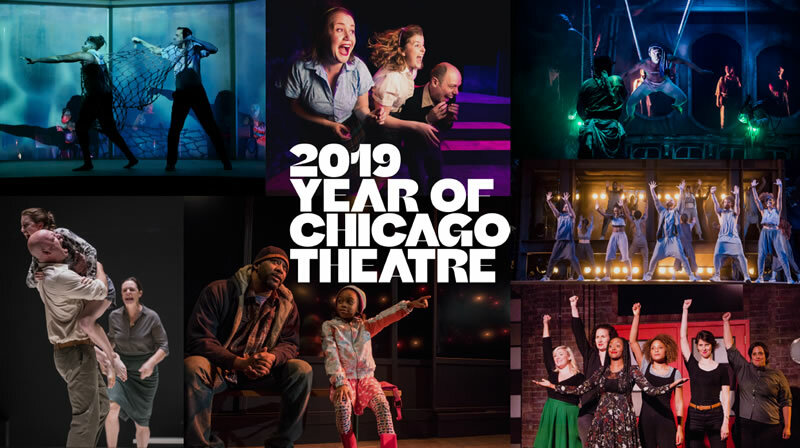 Advancing events, programs and resources to promote broader industry awareness and citywide participation in Year of Chicago Theatre grant and commissioning opportunities. Elevating theatre via LUMA8 Arts in the Dark programs. From Riverwalk Lantern Processions this summer to the Halloween Parade on October 19, these special events featuring theatre groups and artists are designed to highlight Chicago’s diverse cultural landscape. Announced the Millennium Park Summer Film Series (Tuesdays, June 4 – August 20, 2019) co-presented by the City of Chicago and 13 local theatre companies – celebrating the Year of Chicago Theatre. Companies include About Face Theatre, Aguijón Theater, Black Ensemble Theater, Chicago Children’s Theatre, Chicago Shakespeare Theater, Court Theatre, eta Creative Arts Foundation, Free Street Theater, Goodman Theatre, Lookingglass Theatre Company, Rivendell Theatre Ensemble, Steppenwolf Theatre Company, Teatro Vista and Victory Gardens Theater.